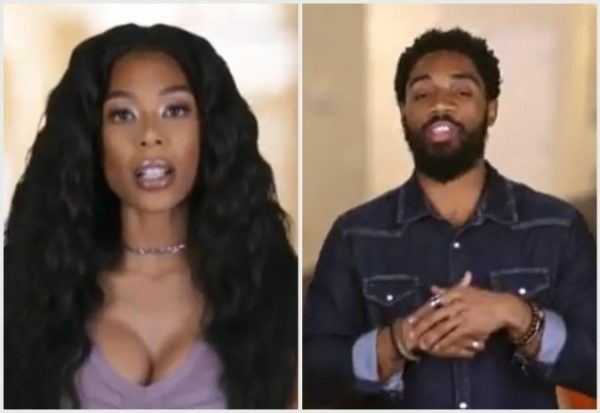 It seems a new romance has formed between “Love and Hip Hop: Atlanta” stars Moniece Slaughter and Scrapp DeLeon, leaving fans at a loss for words. It was speculated earlier this year that Slaughter, who starred on the “Love and Hip Hop: Hollywood” franchise, would be making her way to the ATL with DeLeon as her love interest. Well, the rumors turned out to be true, and the pair appear to be an item on the show. During the second episode of the VH1 series, Slaughter revealed to her cast mates that there was a new guy in her life that she’s been talking to, mentioning that she was “technically still single.” The new man in the singer’s life happened to be Tommie Lee‘s ex-flame, DeLeon, who said he was introduced to Slaughter by his mother Karen “KK” King via phone while he was in prison. The pair apparently communicated via phone until he was released to a halfway house. Scrapp indicated that he and Slaughter have a special “bond,” while the “Petty” singer said she’s actually entertained having a deeper relationship with DeLeon. Viewers witnessed Slaughter make her way on DeLeon’s lap and kissing him with pecks on the lips as they seemingly made their way upstairs to his bedroom. Last year, Slaughter sparked fans’ curiosity after posting a cryptic photo of herself holding hands with a mystery man. That unknown specimen at the time turned out to be DeLeon. The pair’s romance threw the “LHHATL” audience for a loop, drawing mixed reactions.